Can you believe that this soup (aka sauce or gravy) is full of cauliflower, mushrooms, onions and garlic? These are all superfoods that are believed to prevent cancer as well as other illnesses. 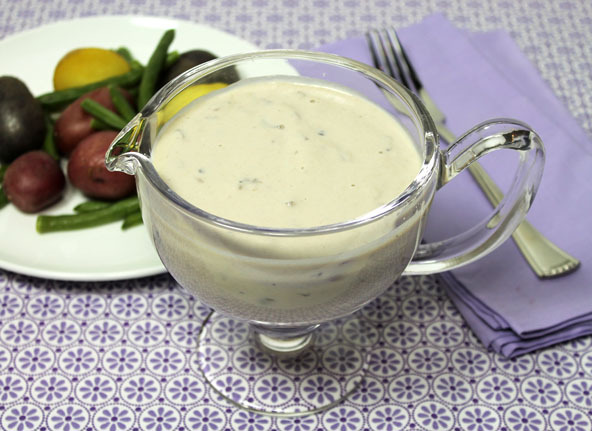 Now your gravy is as healthy as your vegetables. Pouring vegetables on your vegetables without even realizing it is a brilliant concept. Say goodbye to gravy guilt and freely enjoy all you want knowing it is all good for you while your taste buds thank you. For decades the canned version of condensed cream of mushroom soup has become a staple in most homes but have you read the ingredients lately? We don’t need nor should we want the added Monosodium Glutamate it contains. This canned processed soup also has refined oils, white flour, modified food starch and is high in sodium. Sure it’s cheap and convenient but it comes at a cost to our health. This recipe can replace all your needs for cream of mushroom soup in your recipes. Making it fresh will provide many more vitamins, minerals and nutrients that are lost or missing in the canning process. You can make extra and store some jars of it in the fridge for a few days or a month or two in the freezer. Monosodium Glutamate (MSG) is a flavor enhancer. Some foods like cheese, meats and even mothers milk produce MSG naturally, but the white crystalline powder form used in almost all processed foods and in almost every fast food restaurant is not produced naturally. It is a cheap chemical processed version that is highly suspected to cause many unwanted side-effects. As scientists began to warn us about the use of MSG, other names were created so that we couldn’t easily recognize it in the ingredient list. Its other names are hydrolyzed vegetable protein, sodium caseinate, Aginomoto (named after its creator), autolyzed yeast extract, soy protein extract or natural meat tenderizer. As a side note, Wholetarians avoid no-fat and low-fat foods. When fat is removed something else has to be added to take its place. Processed MSG ends up being critical to replace the loss of flavor with the removal of fats in many foods, either that or sugar. Umami is a Japanese word that is known as a fifth flavor for the savory taste. MSG provides this Umami flavor which is why it is added to so many processed foods. Mushrooms happen to be a natural umami flavor and is found in abundance in this recipe. Mushrooms are also a super healthy food, high in vitamin D.
If you find that you have a hard time replacing the addictive flavored canned stuff straight out, try blending the canned with fresh homemade, adding in more and more of the homemade until you are completely in love with the whole food clean version. I made this pasta dish with freshly made hot homemade condensed cream of mushroom soup. Yum. It tastes amazing with all that savory natural Umami flavor from the mushrooms. 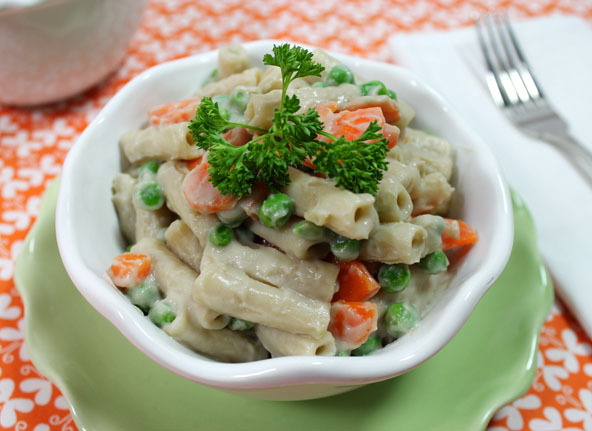 See my Creamy Superfood Sauce and Pasta recipe. In a medium size pot over medium heat, add the coconut oil and chopped onion. Saute for 3-4 minutes and then turn heat to low for an additional 4-5 minutes with the lid on. Don't rush this part as you want the onions to turn soft without burning them. Add your milk of choice, cauliflower, mushrooms, (see notes below on option to saute half of the mushrooms separately) garlic, sea salt and black pepper. Turn the heat back up to medium/high and simmer for 8-9 minutes or until the cauliflower is tender. Turn off the heat and add your cream of choice. Blend the mixture with an immersion blender or transfer the mixture to a blender. Be very careful as the mixture is very hot. You may want to let it cool off a bit first. Be sure to let the lid have a small amount of room for steam to escape while blending. Slowly blend the mixture until smooth. Check to see if you think it needs more sea salt and pepper. 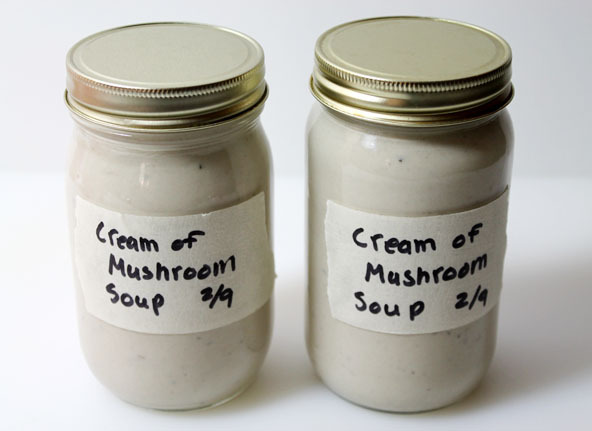 Your condensed Cream of Mushroom soup is ready to be used in another recipe or poured into glass jars for use within the next few days. Allow soup to cool off before storing in the refrigerator with a lid on it. Use masking tape and a pen or marker to date it. You may also freeze it for later. Just be sure to leave ½" to the top to allow for expansion when freezing. The soup in these jars and the top photo were made with the variation shown below. It provides small diced mushroom chunks in the soup. The recipe above is the most kid-friendly without the chunks of mushrooms and the easiest method. However it has a little grayish color (due to the blended mushrooms) and some people prefer having delicious small chunks of mushrooms. Add half (4oz) of the mushrooms with the cauliflower to cook and be blended. Dice the remainder 4 oz of the mushrooms in tiny pieces and lightly sauté them separately in a Tbsp of coconut oil for 2-3 minutes. Add the sautéed mushrooms to the rest of the blended soup mixture at the end and serve. Either way this soup is delicious and oh so good for you. Make this homemade-whole food-healthy version and use it on anything you have used condensed cream of mushroom soup on in the past. Enchiladas, casseroles, as a sauce over steamed vegetables or baked potatoes. It’s an amazing way to help get your veggies in without even realizing it.